As part of our commitment to ensuring an ethical, transparent and fair peer review process SAGE has become a supporting member of ORCID®, the Open Researcher and Contributor ID. 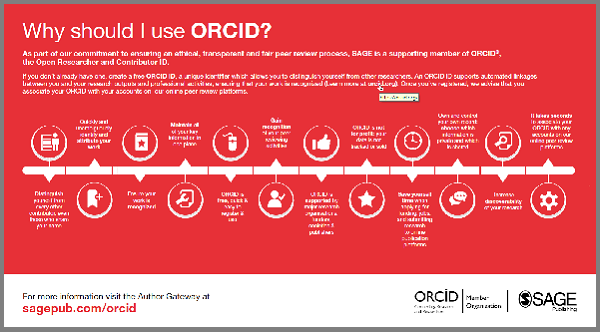 Who is using ORCID and why should I use it? ORCID is a registry of unique identifiers for researchers and scholars that is open, non-proprietary, transparent, mobile and community based. ORCID provides a unique and persistent digital identifier that distinguishes you from every other contributor, even those who share your name, and, through integration in key research workflows such as manuscript and grant submission, supports automated linkages between you and your research outputs and professional activities, ensuring that your work is recognized. Who is using ORCID/Why should I use ORCID? There are currently more than 4.5 million live ORCID iDs linked to more than 30 million different research outputs (publications, data sets, patents etc) from thousands of different institutes across the world [https://orcid.org/statistics]. Regardless of your discipline, or place of work, it is critical to your reputation and career that research and scholarly organisations and funders, publishers, scholarly societies and associations and your fellow researchers and academicians are able to quickly and unambiguously identify and attribute your work, and only your work, to you. ORCID helps you easily and reliably link you unique identity with your contributions such as datasets, journal articles, books, media stories and patents even if your name is expressed differently amongst those records. ORCID recognises that you own your record of contributions. You can maintain all of your key information in one place, and you control your own privacy settings, including what information is displayed publicly, what is shared only with trusted partners, and who those trusted partners are. How can I build my ORCID record? Funding organisations such as the NIH, US; Wellcome Trust, UK; National Institute for Health Research, UK; SRC, Sweden; Department of Transportation, US; QNRF,Qatar; FWF, Austria, FCT, Portugal; RCUK, UK; NHMRC & ARC, Australia are requesting ORCID iDs during grant submission and plan to use it to reduce the burden of grant submissions. Universities and research institutes such as Harvard, Oxford, Australian National University, UCLA Library, Carnegie Mellon University, Macqaurie University, Singapore Management University, Universidad de Alcalá, Universidade de Sao Paulo, Universiteit Maastricht encourage ORCID adoption, and many are integrating ORCID iDs into their systems and in some cases creating them for their researchers. A full list of ORCID members can be found here. We encourage all authors and co-authors to register for an ORCID iD and to link their ORCID iD to their accounts in our online peer review platforms. It takes seconds to do: click the link when prompted, sign into your ORCID account and our systems are automatically updated. We collect ORCID iDs during the manuscript submission process and your ORCID iD then becomes part of your accepted publication’s metadata, making your work attributable to you and only you. Your ORCID iD is published with your article so that fellow researchers reading your work can link to your ORCID profile and from there link to your other publications. One of ORCID’s core principles is that individuals control their ORCID iD and the information attached to it. You should not, therefore, use another person's email address and password to access an account which is not your own. It is particularly important that you do not associate an ORCID belonging to another individual with your accounts on our peer review platforms as this could lead to false attribution of published articles. We have signed ORCID’s open letter and are committed to requiring ORCID iDs in the publishing process for our journals. A list of journals currently mandating collection of ORCID iDs from corresponding authors is available here.